Abstract. Ice cores provide temporal records of surface mass balance (SMB). Coastal areas of Antarctica have relatively high and variable SMB, but are under-represented in records spanning more than 100 years. Here we present SMB reconstruction from a 120m-long ice core drilled in 2012 on the Derwael Ice Rise, coastal Dronning Maud Land, East Antarctica. Water stable isotope (δ18O and δD) stratigraphy is supplemented by discontinuous major ion profiles and continuous electrical conductivity measurements. The base of the ice core is dated to AD1759±16, providing a climate proxy for the past ∼250 years. The core's annual layer thickness history is combined with its gravimetric density profile to reconstruct the site's SMB history, corrected for the influence of ice deformation. The mean SMB for the core's entire history is 0.47±0.02m water equivalent (w.e.)a−1. 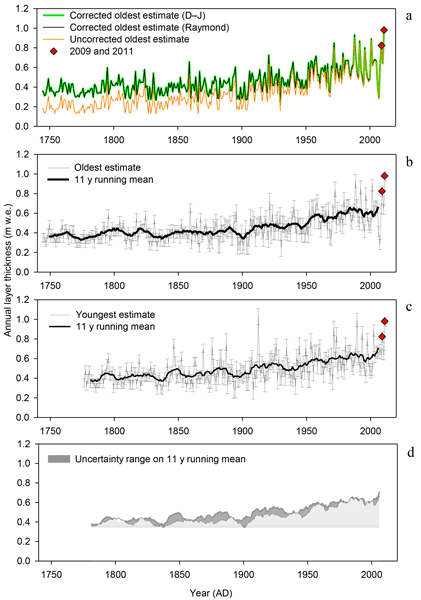 The time series of reconstructed annual SMB shows high variability, but a general increase beginning in the 20th century. This increase is particularly marked during the last 50 years (1962–2011), which yields mean SMB of 0.61±0.01mw.e.a−1. This trend is compared with other reported SMB data in Antarctica, generally showing a high spatial variability. Output of the fully coupled Community Earth System Model (CESM) suggests that, although atmospheric circulation is the main factor influencing SMB, variability in sea surface temperatures and sea ice cover in the precipitation source region also explain part of the variability in SMB. Local snow redistribution can also influence interannual variability but is unlikely to influence long-term trends significantly. This is the first record from a coastal ice core in East Antarctica to show an increase in SMB beginning in the early 20th century and particularly marked during the last 50 years. How to cite: Philippe, M., Tison, J.-L., Fjøsne, K., Hubbard, B., Kjær, H. A., Lenaerts, J. T. M., Drews, R., Sheldon, S. G., De Bondt, K., Claeys, P., and Pattyn, F.: Ice core evidence for a 20th century increase in surface mass balance in coastal Dronning Maud Land, East Antarctica, The Cryosphere, 10, 2501-2516, https://doi.org/10.5194/tc-10-2501-2016, 2016. The reconstruction of past snow accumulation rates is crucial in the context of recent climate change and sea level rise. We measured ~ 250 years of snow accumulation using a 120 m ice core drilled in coastal East Antarctica, where such long records are very scarce. 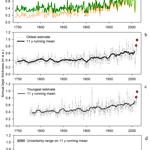 This study is the first to show an increase in snow accumulation, beginning in the 20th and particularly marked in the last 50 years, thereby confirming model predictions of increased snowfall associated with climate change.